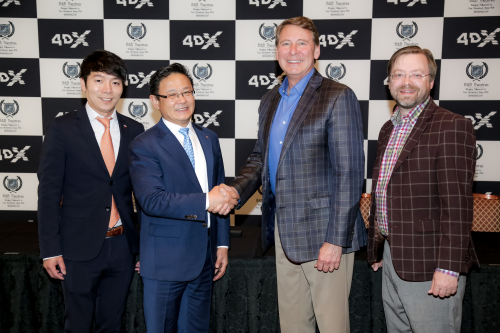 CJ 4DPLEX, the company behind the innovative cinema technologies 4DX and ScreenX, and B&B Theatres, the seventh largest exhibitor in the world, have partnered to bring four ScreenX screens to the cinema operator’s locations. B&B Theatres operates approximately 400 screens at 50 locations across Kansas, Florida, Missouri, Mississippi, Oklahoma and Texas. Before the opening of these theatres with B&B, ScreenX has three locations in operation in the U.S. in Los Angeles and Las Vegas, and more than 135 total screens globally. B&B Theatres will install the largest ScreenX system in the world in one of the two Premium Large Format (PLF) Grand Screens in Liberty, a screen that will be over four stories tall and seven stories wide. The screens with B&B Theatres are set to be the first in the U.S. outside of the American west coast. ScreenX is the world’s first multi-projection theatre technology, created in 2012 to enhance the movie environment by allowing moviegoers to go beyond the frame of the traditional movie screen. It utilizes a proprietary system to expand images of feature films and pre-show advertising to the left and right walls of the theatre, creating an immersive, panoramic, 270-degree experience. “ScreenX coupled with our B&B Grand Screen will create the most immersive movie-going experience imaginable. This breaks barriers into a new realm of cinema presentation and we are so excited to be the largest ScreenX system in the world” said Executive Vice President Brock Bagby.